We offer these for every goat breed. GetYerGoat offers shirts for goat lovers. Keeping the goat breeder in thought, we offer the Awesome Goat Lover T-shirt in your breed of choice, which makes the perfect goat lover’s gift for any occasion. I’m sure you love goats as much as I love goats and I try to offer you any chance to show off your favorite goat breed and add your farm name or herd name. Proclaim your love for your goats! This is what An Awesome Goat Lover looks like- for Goat Lovers. Add your herd or farm name or delete the option. Simple Thumbs up and goat breed with silhouette of the goat. 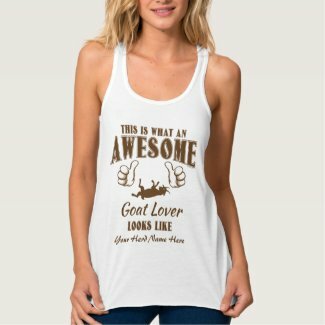 Great Goat Lover’s Tshirts, hoodies or sweatshirts for men or women. Proclaim your love for your goats! This is what An Awesome Goat Lover looks like- Add your herd or farm name or delete the option. What a fun way to Promote the Goat™ ! 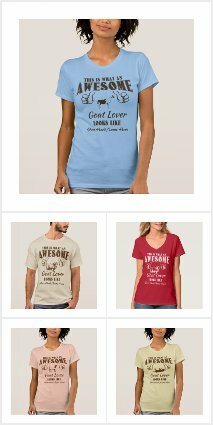 This entry was posted in Cool Goats, T-shirts and tagged Awesome Goat Lover T-shirt, boer goat shirt, GetYerGoat, goat breed shirts, Goat Lover T-Shirt, goat lover's gift, goat shirt, goat t-shirt, goats, i love goats, myotonic goat t-shirt, pygmy goat shirt, shirts for goat lovers on September 30, 2016 by goatlady.